Some plants have these cells in their roots, like some Euphorbias. Others have them in their stems, like Stapliads and Pachypodiums. Cacti also have this ability and this is why a cactus is a succulent. It is similar to the saying, “All German shepherds are dogs, but not all dogs are German Shepherds.” All Cacti are succulents, but not all succulents are cacti. So what defines a cactus? 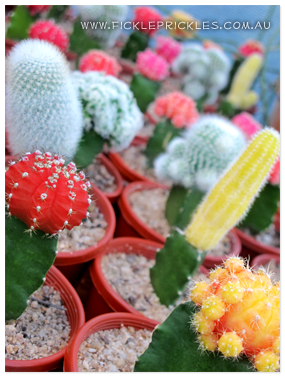 All cacti belong to the plant family Cactaceae, and there are many characteristics that identify a plant as belonging to this family. SPINES are not one of them! Don’t get fooled into thinking that a cactus is a cactus just because is has spines. There are many species of succulents with spines that aren't in the Cactaceae family, such as some Euphorbias and Agaves. On top of that, some cacti don’t have spines at all, like most Lophophoras. Photo 1: The cactus Trichocereus sp. with white, cotton like areoles. Photo 2: Another cactus, Trichocereus sp. also with white, fluffy areoles. Photo 3: The succulent Euphorbia trigona, which has spines but no areoles. So, the next time you look at a succulent, look to see if they have areoles. Then you will know for certain that it is a cactus, or not. Remember though, there are exceptions to every rule, and cacti are the hardest of all plants to identify. Be prepared for a lot of research and patience if you wish to identify what species of cactus your plant is. When you think that we spend more than 80 percent of our lifetime indoors, whether it be at home or in the office, it is very important to consider the quality of our indoor environments. We all want our homes and offices to reflect a neat, clean, beautiful setting to work or relax in, and indoor plants are great way to help achieve that goal. Their colours, shapes and textures all contribute to the look of your home or office. What you may not know is that not only do indoor plants improve the aesthetics of your indoor spaces, they also have numerous amounts of health benefits, both psychological and physical! Your mood is very much reflective of your surroundings. Plants can liven up a dull space by adding much needed colour and vibrancy. They can make you feel more 'at home' by creating a cosy environment in which you can more happily live in. Indoor plants can help you to feel more optimistic, and reduce feelings of sadness, anger and anxiety. It is said that hospital patients who have a garden view to look at out a window recover far more quickly that those who face a wall. Plants in the office are a great way to improve morale among your colleagues. They help motivate employees by stimulating the brain. Some businesses who have placed several potted plants around their office have reported definite increases in productivity and creativity, and a significant reduction of stress among their staff. Plants help you fight away colds and allergies! It is understood that indoor plants can help you to fight sore throats, coughs, congestion, minor headaches, itchy skin, asthma and other symptoms related to colds, flu's and common allergies. They do this by maintaining appropriate humidity levels in your home and decreasing levels of dust. Plants are your own personal bio-filtration system! On top of that, new paints, carpets and furnishings are known to radiate volatile organic compounds (VOC's) that are toxic and can cause you harm. It is believed that sick building syndrome can make you feel nauseous, light headed and can be the cause of allergy symptoms and many neurotoxic health problems. Another contributor of poor air quality can be gas stoves or ovens. Regular use of household gas appliances can create a build up of unwanted nitrogen oxides in your home. The good news? Plants are a natural filtration system and have oxygen replenishing qualities! They actually absorb pollutants in the air and emit fresh oxygen - It is said that they absorb nasty toxins and pollutants in the air through their leaves and then transmit these toxins to the roots, where they are converted into nutrients for the plant. 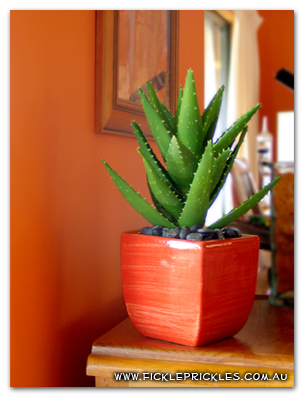 By having plants in your home you can reduce the levels of these toxins and contaminants dramatically, leaving the air cleaner and fresher. Some electronic devices, such as computers, televisions, video recorders and DVD/CD players emit small amounts of EMF radiation. Cacti are believed to be excellent absorbers of these emissions and can help ease minor headaches and reduce electromagnetic stress associated with EMF radiation. How it works is that the spines on a cactus apparently attract charged ions in the air and change ionisation levels of a room. So it is a great idea to keep a cactus or two on your desk and definitely next to your computer!